THE GALACTIC COLLECTIVE is a brand new take on the best of Erik’s vast instrumental compositions written for Rocket Scientists, Lana Lane and his own solo albums over the years. The DVD and 2CD set includes the complete album, ERIK NORLANDER - THE GALACTIC COLLECTIVE, performed LIVE at The Rites of Spring Festival 2011 along with the “Into the Sunset Suite” and the Norlander-penned Lana Lane songs, “Capture the Sun” and “Secrets of Astrology” creatively woven into medleys to complete the celestial sojourn with guest vocals by none other than Lana Lane herself! Erik’s Modular Moog synthesizer, “The Wall of Doom,” was used extensively at this concert, and band is introduced with an excellent and informative monologue from Michelle Moog, Executive Director of The Bob Moog Foundation and daughter of the late maverick synthesizer pioneer and inventor, Robert Moog. Full color, detailed booklet includes not only beautiful photos from the concert but also liner notes by Erik's synth tech, former Moog Music designer and ELP keyboard tech, August Worley, along with an additional article written by Erik himself especially for this release. Featuring Erik Norlander (keyboards), Freddy DeMarco (guitars), Mark Matthews (bass) and Nick LePar (drums) with special guest vocalists Lana Lane and Debrissa McKinney. "This brand new live concert DVD and two CD set features a full show recorded at The Rites of Spring Festival in 2011. The amazing set list consists of the very best of Erik Norlander's instrumental works that originally appeared on his solo albums, his works with Rocket Scientists, and his works with Lana Lane. As such, this brilliant performance sums up Norlander's whole career as a keyboard player, composer, and producer; long may it continue. These compositions were first re-recorded live-in-the-studio in 2010 resulting in The Galactic Collective studio album. That album gave a very convincing snapshot of Norlander's immense talents as a composer and instrumentalist, but it is on this excellent live recording that these tunes really come to life. In addition, this live performance offers more great content as well as a visual element. Fans of people like Rick Wakeman, Keith Emerson, and Patrick Moraz should sit up and take note. Norlander will blow you away! The concert opens with Arrival and Neurosaur that originally opened Norlander's first solo album, Threshold from 1997. This number has since become something of a signature tune for Norlander and it fits perfectly as a show opener. Next up is Fanfare For Absent Friends that originally was on Erik's Progressive Electronic solo album Seas Of Orion from 2004. This live version is clearly more rocking than the original version and an improvement on an already great tune. They carry on with Sky Full Of Stars, originally from the conceptual Music Machine album from 2003. This symphonic instrumental is creatively merged with the Lana Lane song Capture The Sun which features Lana Lane herself on lead vocals. This is the first out of four vocal numbers in this otherwise entirely instrumental show. Lana Lane is an amazing singer and adds great value to this performance and the presence of a few vocal numbers among the instrumental ones brings a very nice variation to the whole. Lana Lane appears on lead vocals again on the next number, the superb Secrets Of Astrology. While on the studio version of The Galactic Collective only the instrumental introduction Astrology Prelude was recreated which felt a little truncated without its natural companion in Secrets Of Astrology. On this live performance, the whole Astrology Suite is restored the way it should be and the way it was on the excellent Lana Lane album of that same name. Another tune from Threshold follows in Trantor Station, another wonderful, spacy instrumental. After The Revolution is the first out of two Rocket Scientists numbers, this one originally appearing on the 2006 Revolution Road album. Like almost every track here, this is the ultimate version. The 20 minute plus The Dark Water was originally split up into shorter introductions and interludes on the Rocket Scientists albums Brutal Architecture and Oblivion Days, but here they are presented as one long piece as on the studio version of The Galactic Collective. While on the latter I felt that it was a bit too long for its own good, this live version justifies the great length of the song. In addition to all of the tunes from The Galactic Collective, Norlander also treats us to an extended suite from his very good solo album Into The Sunset containing two vocal numbers again performed by the wonderful Lana Lane. This amazing suite constitutes a very valuable addition to the set. However, the piano-driven Dreamcurrents is the only tune that I think is better on the studio version of The Galactic Collective (due to the middle section on that extended version being present neither here nor on the original Into The Sunset version). Still, this truncated version is not bad at all and contains simply brilliant piano playing. For some reason, the recording of Garden Of The Moon is taken from a different show and is a bonus track on the DVD but part of the main set on the accompanying CDs. Another difference between the DVD and the CDs is that some of the in-between-song-banter has been appropriately edited out on the CDs. This is I think a very good idea and justifies the addition of the two CDs in the package. The CDs are preferable for repeated listening. In conclusion, this is nothing short of a live masterpiece and there is no doubt about the rating here. Very highly recommended!" Melodic Progressive Rock 5.0/5.0 !!! "The Galactic Collective roots go back to the turn of the millenium. Erik Norlander wanted, at some point, to take his favorite instrumental pieces, whether recorded with Lana Lane, Rocket Scientists, or on solo efforts, and give them new life in new arrangements. In 2010, his vision came to fruition with The Galactic Collective. Here we have, not just the original album, but more in the Definitive Edition. Considering again the DVD side, first, we have the studio recordings that were shown on YouTube. This is great stuff. But what's even better is Norlander's comments before every song. Here you get not only the history of the song, but also what he intends to develop in these new recordings. If you're a musician, you'll get this; having the ability to envision new interpreations of your material is mouth-watering stuff. Again, as mentioned in my review of Live in Gettysburg, Norlander is articulate and gracious. Also included on the DVD is a 22 minute feature about the 'Wall of Doom,' the affectionate description of Norlander's synthesizer monolith. Techheads and keyboardists will rejoice as he describes and explains in some detail the technical aspects of this instruments. Mostly, I didn't get what he was talking about, but it was cool nonetheless. Regarding the CDs, one offers, of course, The Galactive Collective studio recording. The second, called Echoes from the Collective delivers variations on Sky Full of Stars, Garden of the Moon, and The Dark Water called The Darker Water. Yet, fans will likely dig another representation of theme from Space: 1999, a staple of Norlander's catalog. As with Live in Gettysburg, the Definitive Edition is marvelous. Both are highly recommended." 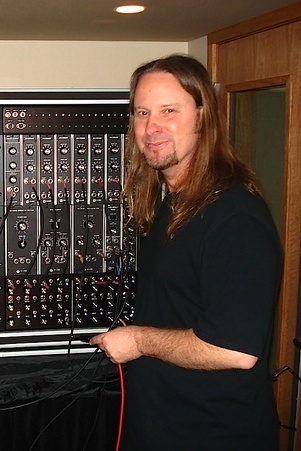 Keyboardist, composer, producer and sound engineer, Erik Norlander's all at once. Originally from California, juggler has composed and produced nearly 30 albums since 1993, and this, with singer Lana Lane and Rocket Scientists group. There are also albums as a soloist and also several guest appearances on albums by other artists for this technician finally following the path mapped out by the masters of this art are Keith Emerson, Rick Wakeman and John Lord! A perfectionist at heart, he perpetuates the mood of the seventies thanks to the legendary vintage keyboards, but also looks to the future with modern synthesizers. First part of this musical and visual showcase of the musician, since a second box is also available and will be chronicled later on our site. This is the first studio side that will be developed here with two audio CDs and a DVD for a total of nearly four hours. And therefore from the intro and the first compositions played, we feel a great work and professionalism on the part of this artist. Here, it is far from Rick Wakeman albums recently Reviewed! The sound is excellent and the atmosphere smells the progressive rock and progressive metal, also with the presence of more lyrical passages and more playful. Keyboards are here of course demonstrative without being syrupy. As for the electric guitar, it will also offer some beautiful solo passages. Do not forget to mention many passages in classical piano that will be, too, well crafted. On the role of each protagonist, the emcee work keyboards and Yamaha pianos and Rhodes as well as the traditional Moog, Mellotron or Hammond. This is Mark Mathews who held the bass. Nick LePar will handle the drums and percussion. As for Freddy DeMarco, he will master the electric guitar. Add the presence of Lana Lane on vocals and John Payne, himself, who will accompany the group for three compositions. If one wanted to look for similarities or benchmarks, I would say that we approach projects from a Clive Nolan but also, for some passages of Vangelis or Ryan Farish. The set, which will evolve a progressive rock music to a more epic, will be very attractive to eventually follow. To get to the DVD that will complement the cabinet with the detailed presentation of recording sessions with beautiful views in the studio. We shall see the beautiful work of each musician. The genesis of the compositions, the composer's approach and its equipment will also be impressive to watch for a total of nearly two hours! Hours and hours, I tell you, to understand this strange character certainly came from elsewhere. Along with a Clive Nolan, the composer-keyboardist has a career that commands respect from all of us. A box that any fan of keyboards will of sinking body and soul. Also a box with a large illustrated booklet that anyone should listen at least once to realize the great job done! Prolific composer, significant keyboard player, and husband of Lana Lane, Erik Norlander offers fans and friends some extravagence. Here, in two parts, is an intriguing and entertaining adventure into his wonderful 2010 recording The Galactive Collective. The album is a reimagnining of some of Norlander's favorite instrumental pieces, many of which have gone through numerous revisions even prior to this recording. Norlander delivers The Definitive Edition, which is a look into the actual studio sessions, as seen on YouTube. The second part is Live in Gettysburg where Norlander plays nearly the entire album live at RoSFest. Both sets offer DVD and two CDs to compliment. Mostly I'll be considering the DVDs, with some brief comments on the CDs when necessary. Since I love live albums, we'll consider Live in Gettysburg first. Erik Norlander is not a stranger to live recordings. But considering the significance of The Galactic Collective, the revisioning of his favorite instrumental pieces, playing it live is also rather important. Simply, this performance is equally magnificent and substantial. The recording was made at the Rites of Spring Festival (RoSFest) in Gettysburg, Pennsylvania, not far from Dangerdog HQ. Notable at the start is the homage paid to synthesizer pioneer Robert Moog by his daughter Michelle Moog-Koussa. She invokes the memory of her father while introducing Norlander, who found his voice by using Moog's inventions. Then we're treated to nearly the entireity of The Galactic Collective in live performance, with some interesting inclusions. As to the exceptions, Dreamcurrents is included in the Into the Sunset suite. More on that in a moment. Garden of the Moon, from the Lana Lane album, is included as a bonus track recorded in Cleveland. Norlander broadens this performance of TGC by integrating Capture the Sun into Sky Full of Stars. Lana Lane is on call for this vocal performance, and the others to come. This includes adding Secrets of Astrology to the Prelude. At the end, Norlander and company give us an extra, something beyond TGC: Into the Sunset Suite, which includes three-part harmony of Hymn. Marvelous stuff. Perhaps the most compelling part of the live performance, not dismissing the exceptional music and musicianship, is the song introductions by Erik Norlander. He offers insightful comments about the songs that give more color to them. But more importantedly is the fact that Norlander is well-spoken, gracious and quite appreciative of his audience. Those qualities go miles for this listener. Bottom line: The Galactic Collective - Live in Gettysburg is terrific. The Galactic Collective roots go back to the turn of the millenium. Erik Norlander wanted, at some point, to take his favorite instrumental pieces, whether recorded with Lana Lane, Rocket Scientists, or on solo efforts, and give them new life in new arrangements. In 2010, his vision came to fruition with The Galactic Collective. Here we have, not just the original album, but more in the Definitive Edition. As with Live in Gettysburg, the Definitive Edition is marvelous. Both are highly recommended. Erik Norlander’s biography on his website starts by saying he is a progressive rock keyboardist, composer and producer from California that has written and produced over 30 albums since 1993 with his chanteuse spouse Lana Lane and his band Rocket Scientists. Is that enough to impress? I would think so if you have never heard of the artist or any of his work. Erik’s band consists of Freddy DeMarco (guitars), Mark Matthews (bass), Nick LePar (drums) and his lovely spouse Lana Lane (vocals). I can you tell you he does back up that initial statement with a solid back log of recordings and most recently this 2CD/1 DVD collection Live In Gettysburg distributed by the folks at Gonzo Multimedia. This is a beautiful set that gives you the option of popping the CDs in your stereo or iTunes or kicking back and watching the entire concert and listening in surround sound. I enjoyed both experiences completely. The thing about a guy like Norlander is that he does not stand out in the hall of legendary ivory ticklers such as a Wakeman, Emerson or Rudess. After listening to all of his music I think it may be time to look a little harder at this great musician and all of the tremendous contributions made to the development of keyboard advancements and the great progressive rock he has produced. It takes a set like this for it all to sink in entirely. I found Norlander’s music moving, majestic and powerful. It makes you feel like you are getting ready to go into battle with King Arthur and his court at times or at the other end of the spectrum with the thought of the “Galactic Collective” term in mind, you have visions of deep space exploration or floating amongst the stars via the spacey notes emanating from his very large keyboard set. 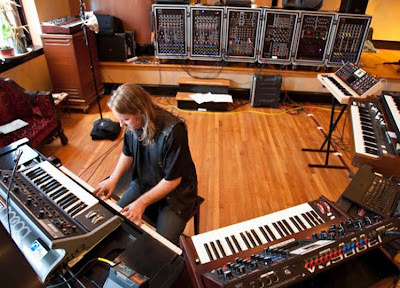 He has that monstrous wall of equipment similar to what Keith Emerson used when he was with ELP. I find it difficult to single out any one track as being a stand out from the rest as the entire collection is outstanding. Visually there is not a lot going on with the DVD, it is just the band and Erik talking about the songs, the equipment and how the band came together. Things like that can be of interest to a listener. If you looking for a visual presentation you will not find it here, however if your only concern is what you are hearing then it takes no more than shutting your eyes and letting Erik and his band take you wherever you please. I also enjoyed the vocals of Lana Lane. She has very powerful set of pipes and a good stage presence. By the time this entire experience was complete I found myself looking at all the releases Norlander and Lane have available. Everything is listed right on his website so it is worth exploring if you are interested. Live In Gettysburg is a must have collection if you enjoy keyboard music and or progressive rock. Don’t miss out on this release. 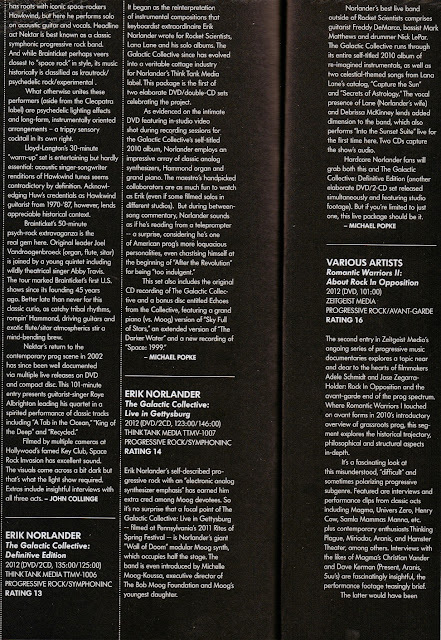 What can you say about Erik Norlander? The guy produces quality products, plain and simple. This live DVD is just such a thing. If you like progressive rock that is fairly mainstream, yet still meaty and creative (and really since a lot of this is instrumental, how mainstream can it be?) then this is for you. It would be a great introduction to the work of this awesome artist. The sound is great, the video is great and it’s a pretty perfect product. Norlander is joined on this one by Mark Matthews (bass), Nick LePar (drums), Freddy DeMarco (guitar), his wife Lana Lane (vocals) and Debrissa McKinney (vocals). It includes not only the DVD, but also a double CD set of the audio from the show. Frankly, I think every DVD should come that way. Erik Norlander is almost known to everyone that’s dealing with atmospheric, rock, symphonic, progressive, instrumental, keyboard-driven music. He’s the main composer for Lana Lane and he had also formed the Rocket Scientists back in the late 80s. 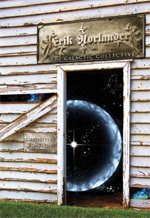 “The Galactic Collective” was released in 2010 when Erik decided to re-record some of his beloved instrumentals from his solo albums along with a couple of tunes from Lana Lane’s works and some from Rocket Scientists that he had written. So, some may wonder what’s new in this release. First of all, we’re talking about two separate releases. The first is “The Galactic Collective - Definite Edition” which contains two audio CDs and one DVD with more than two hours material. Erik has done something very ambitious and innovative here. He re-recorded those instrumental songs from the beginning, taped them in the studio, recorded them and delivered an ultimate package that’s containing music and video for over 4 hours! The first CD is the same one that was released in 2010 (same songs but re-recorded), the second one, “Echoes from the Collective” is a bonus CD that’s containing 4 songs, “Space: 1999”, “Sky Full of Stars" (piano & vocal version-amazing indeed), “Garden of the Moon” (long version) &”The Dark Water” (an extended version from “The Gallactic Collective” sessions that adds about four minutes to the epic suite with an additional guitar solo, synth solo and extended sound effects jam section) and of course, the magic moment comes with the excellent DVD. “The Galactic Collective - Definite Edition” was mixed & produced by Erik Norlander & mastered by C.S Brown at Stuffy Room Studio at Murfreesboro, Tennesse. “Echoes from the Collective” was mastered by Erik Norlander except for “Garden of the Moon” (long version) which was mastered by C.S Brownduring during the original album mastering session in March 2010. 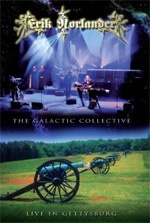 “The Galactic Collective - Live in Gettysburg” is also a DVD with 2 CDs that were recorded/taped at The Rites of Spring Festival in May 21, 2011, which was held, that time, in the iconic Civil War battlefield city of Gettysburg, Penssylvania. For this show Erik gathered two groups of artists from both the North (Akron, Ohio) and the South (Asheville, North Carolina) so as to play “The Gallactic Collective” entirely. Erik has been asked to play a full two hour set and so in addition to “The Gallactic Collective” album, he added the songs “Capture the Sun” & “Secrets of Astrology” that he had written for the Lana Lane albums, “Red Planet Boulevard” & “Secrets of Astrology” which respectively fit to the whole celestial theme of the show nicely. For the end, he presented “Into the Sunset Suite” live for the first time ever! The live show is very pleasurable… to watch and listen to… and I know that most of you (including me) will prefer to watch it and “steal” some of its enchanted atmosphere of that night. A great show to attend to… lucky those who did watch it. Artists who accompanied Erik that night were Freddy DeMarco (guitars), Mark Matthews (bass) and Nick LePar (drums) with special guest vocalists Lana Lane and Debrissa McKinney. “The Galactic Collective - Live in Gettysburg” was mixed & produced by Erik Norlander & mastered by C.S Brown at Stuffy Room Studio at Murfreesboro, Tennesse. The production is as astonishing as “The Galactic Collective - Definite Edition”. The whole package is kinda irresistible, even if you do own “The Galactic Collective” CD, for we’re talking about 2 DVDs and 4 CDs here… well almost 8 hours full of progressive, instrumental, theatrical, atmospheric, symphonic, emotional, ambient, keyboard-laden music! I can’t think of any good reason why someone might miss this incredible music package. This is an acclaimed purchase for the fans of the genre and generally for all music lovers. It definitely deserves a place on Grande Rock’s “Hall of Fame” as it is perfect in any way! PS: Click at: “Definitive Edition” & “Live in Gettysburg” to get more info about the tracklisting and the line-up of the releases. You can also listen to some songs there. It's time. After The Galactic Collective Definitive Edition has been put under the microscope, the entire package is now in the live version in your own four walls. That here on two CDs and one DVD to adoring concert was recorded at the Rites Of Spring Festival 2011 in Gettysburg. Only "Garden Of The Moon" is from a performance in Cleveland. The aforementioned studio output was very convincing. With "The Galactic Collective Live At Gettysburg" of the protagonist and his excellent accompanist definitely exceed the threshold of the tip.The two carriers have exhilarating sound. In the live versions of the numbers are even more pressure, have a greater degree of freedom for improvisation, and if one adds the impression of taking the DVD, this three-pack is a treat for the senses. Compiling the tracklist reflects Norlanders personally selected compositions from his creative period as a solo artist, with his band Rocket Scientists and Lana Lane . This album also gets a tip so graphic, because one of the DVD's menu to select the gig as a full concert. According to the list of numbers was to be feared that the presence of the "Introducing ..." parts had been constantly interrupted. Such is the pleasure to serve on some announcements of the protagonist, but that do not interfere, but the information to experience pure. Of course, the DVD also the opportunity to all to what is listed in the tracklist to see. However, the first concert will be selected. The music is very diverse and symphonic rock as more than enough as the top category. Of course, the band also indulges the progressive rock. As a cross reference there in phases with classical, jazz or (less likely) bluesy excursions. The group plays like a close-knit community, and Erik Norlander see in his work on the fingers, is simply a delicacy. Not only when the singer Lana Laneand Debrissa McKinney with their magnificent voices of the party, fascination is announced. Whether on CD or DVD including "The Dark Water" is one of my absolute highlights, because this almost twenty-one minute track all the attributes of the music of Erik Norlander coalesce into a giant epic. With the activated visual channel is necessary to establish beyond doubt that the stage performance was camera work, image editing and light show set top official in the limelight. Even when there are no sound gripe. 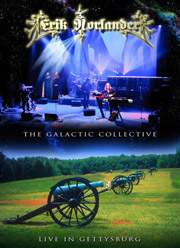 As a retrospective, "The Galactic Collective Live At Gettysburg" the perfect package. Who's a fan of this kind of music can not help but, here to express his full enthusiasm. Initially with reluctance to the zoom thing going, has "The Galactic Collective Live At Gettysburg" fully convinced, step by step, or better track by track. The music is not just Norlanders keys wizardry designed so complex that every listener will find his favorites. Guitarist Freddy DeMarco is a real-wisp on the acoustic or its various electric guitars, which he also uses the bottleneck or a violin bow. To the three pieces of silver you get even a booklet, what its name justice. It's all fourteen pages thick and contains magnificent images concert also a text by August Worley , among other earlier keyboard technician at Emerson, Lake & Palmer was. Erik Norlanders retrospective as a studio version is very good. However surpasses "The Galactic Collective Live At Gettysburg" this issue and becomes a must-buy for fans of genre. Erik Norlander is hardly a new name in progressive rock. As a keyboard player with Rocket Scientists he has become known as a real keyboard hero of the modern age. This reputation was cemented with his solo records and his contribution on Lana Lane’s music. Lately, he’s also put out a couple of DVD releases, including this live performance in Gettysburg, which includes a DVD and 2 audio CDs. The DVD starts with an introduction by Michelle Moog-Kaussa, which is fitting since Erik is an avid supporter of Moog synthesisers and uses them for practically all his solos. Then the band goes into a set consisting of some of Erik’s best known pieces, either solo or with Rocket Scientists – pieces like Trantor Station, Into the Sunset and Neurosaur. Erik quickly establishes himself as a first rate keyboard player, especially on the Moog synths. The musical influences mostly come from other synth greats, like Rick Wakeman, Keith Emerson, with the mellower parts reminiscent of Rick Wright from Pink Floyd (even more so when the two vocalists add choral vocals and we get a Great Gig in the Sky vibe). I think it’s important to state that while Erik is a great soloist and a virtuoso, he is a very tasteful player and several older players could take a leaf out of his book. At the end of this live concert you do feel a bit “Mooged out”, so to speak. You start missing solos on piano, Hammond and other keyboard sounds. Erik is a fabulous player and I’m sure fans of his music will enjoy this set. I know I have, but it might be best enjoyed in several sittings if you, like me, can handle smaller doses of all those swirly Moog solos. Besides Erik, there’s a whole cast of wonderful musicians on display here. The guitarist is another quick yet tasteful player, the rhythm section more than competent and the two vocalists work together wonderfully as well. Lana Lane also provides the occasional lead vocals, which is a nice “escape” from the “synth overdose”. There’s much talent at display here and you can’t really argue against that. Erik is also a more than competent composer and arranger. My mouth starts watering at the prospect of the new Asia album (the John Payne version) and what he could bring to the table. For the time being, these DVDs will keep my expectations high. Live in Gettysburg is about as good as it gets in terms of live albums. Everything is spot on – the song selection, the performance, the sound and the crowd response is just enthusiastic enough. 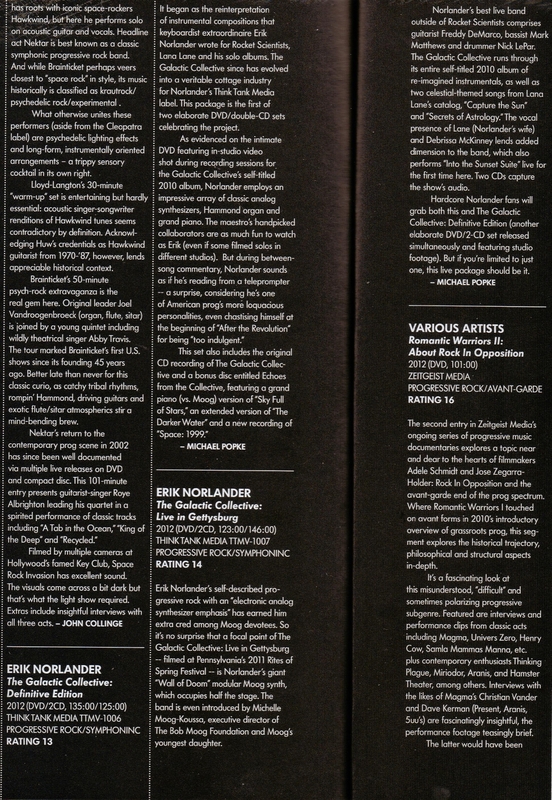 I am getting increasingly fond of the music of Erik Norlander. He is one of the most delightfully lyrical musicians that I have ever encountered, and his compositional skills just continue to get better. Why this man isn't far more widely known, I have no idea. A review copy was provided by the record label Gonzo Multimedia. • The DVD is much more interesting to watch than the companion DVD “The Galactic Collective – Definitive Edition” (reviewed elsewhere). Watching a band performing on stage is indeed much more fun than watching that same band recording in the studio. • Excellent sound (audio CDs, DVD) and vision (DVD) quality. Here is the continuation of my recurrence of the studio album "The Galactic Collective". As I already mentioned here, has the live version of this album more lively, even heavier. Live is a live and has a different magic when layered over each other single-slice computer at the studio. So also always have time for great improvisations which are rewarded with applause, the Ohrenscheinlich somewhat smaller audience. At the song selection has two exceptions changed nothing: the floydigen "Sky Full of Stars" is followed by the Lana Lane number "Capture the Sun" (from the Red Planet Boulevard album) on, which then also to the already familiar "Astrology Prelude "leads over, this time it's there but as a complete suite. Finally, there's still a premiere: "Into the Sunset" is available as a suite for the first time live and on the ears. What I bemäkelt in the studio version is still time swept off the table: now can also Norlanders better half, Lana Lane, often to the mike and gives the synth walls more dynamic. You do not have to say that it is the Lana Lane numbers show the hidden highlights of this love again and the packed publication. The DVD presents what you hear then again for post-looking. Two full hours there's a clearly motivated performance at the "Rites of Spring Festival" (except "The Garden of the Moon" Live from Cleveland is). Image quality and camera work are optimal, only the intermediate announcement to take the songs to a whole bisl the river. The collector uses naturally to two publications, the first-time and casual Norlander / lane listeners prefer to grab the live version.